You can use any of these banners/badges on your blog or web site to show support for ME/CFS International Awareness Day on 12 May (every year). These images can be freely used and distributed for use on blogs, web sites and newsletters. Please no merchandise to sell without our permission first (eg. t-shirts) including for charity and no commercial use. Either save a copy to use or copy the code that follows. The code shown here links to this blog. You can change that to link to another CFS/ME site if you wish. The above images can be freely used and distributed for use on blogs, web sites and newsletters. Please no merchandise to sell without our permission first (eg. t-shirts) including for charity and no commercial use. Creative Commons Attribution-Non-Commercial-Share Alike 3.0 Unported License. From ME/CFS/FM Support for Tropical North Qld. Hi, Congratulations on the badges! I think they look really good and the messages are concise while still packing a punch. 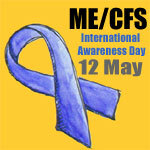 1) in the me-cfs-ribbon-symptoms.jpg the word ‘disfunction’ should be spelt with a ‘y’ ‘dysfunction’. 2) in the me-cfs-ribbon-figures.jpg the word ‘effects’ should be ‘affects’. Thanks. I’ve made corrections & uploaded new versions. The new badges are great. Thanks for creating them so quickly. I did notice a type in the Canada stats – it’s missing a “0” . It should be 334,000. Oh no! You’re right! I’ll get a corrected version up. Thanks! thx so very much for all your hard work for all of us greatly appreciated and look forward to being well enough to make a few of my own. Can you tell me what software you used to create your badges? some of these logos and signs are copyrighted material belonging to RESCIND, INC. it is nice that you are trying to gather information to help sick people, but RESCIND, INC. started May 12th, we paid money to copyright our logos and symbols, we spent many thousands of dollars to keep May 12th alive for 19 years. we would like to speak with someone here to see what is going on. thanks. and ask for Thomas M. Hennessy, jr. thanks! Have emailed you. There is a link to RESCIND next to your logo/badge and please be assured there is no intention here to infringe copright – only to direct people to the good work you do. on May 8, 2011 at 10:46 am | Reply » Det blå båndet – Vis at du bryr deg! – 12. mai er en merkedag! Thanks for all the badges! Awesome! Great idea to get lots of badges in one place. You’ve done some awesome work.